Panda Cloud Antivirus is real-time protection against any malicious software attacks. The "cloud computing" technology allows the program to work and protect the computer without impacting the performance of the computer, analyzing the files and executables and, in case of infection, the program acts to block their access into computer and the information is instantly communicated to allother users of the software. This way, the user can work, surf or play online, without being aware that there is an antivirus that is working in the same time. It also provides web filtering, warning the user against suspicious sites, stealth operations or phishing sites. 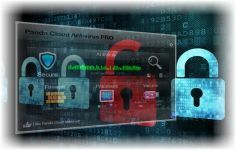 The antivirus has an auto update option for the virus database which makes the Cloud Antivirus is very easy to use, the interface being minimalist but presenting essential information such as: antispam, firewall or parental control software dedicated. - More modern, more intuitive. Easier than ever before. - One of the most demanded features from our Community. And now its available in the FREE & Pro versions! - Extremely useful in emergency situations caused by malware infections. - This feature, which was only available to Pro users in previous versions, is now available for free! - Find out if someone is stealing your Wi-Fi. The new Panda Cloud Antivirus 3.0 incorporates a Wi-Fi monitor that shows a list of all the devices currently connected to your network, helping you find out if there is an intruder on your Wi-Fi network. - An exclusive area where youll be able to download your products, manage your services, obtain documentation, get technical support through the new Technical Support Forum and, only for Pro users, receive personal VIP support via an online form. Additionally, you will be able to manage all of your Panda Consumer products from this area, as well as your Android devices if they are protected with Panda Mobile Security. * Performance improvements to make Panda Cloud Antivirus lighter than ever.